I am the Good Shepherd, these are My prayers, the prayers I give to help renew the Church and the world, all prayer chapters are asked to include these prayers (found in the Shepherds of Christ Prayer Manual. As My Apostles and Shepherds I ask you to encourage all existing Chapters to try to encourage all existing prayer groups to pray the Shepherds of Christ prayers. Encourage all Churches to pray these prayers. It is most urgent that the people of this earth concur with the Father's wishes to begin Prayer Chapters. This is an urgent request from the Good Shepherd. The flock will become one when they have given their hearts to Jesus and Mary. Encourage all priests to pray the Shepherds of Christ prayers. Your world will be lighted with great light as the people of this earth pray these prayers. My promise is this to you My beloved earth: When you give your heart to Me and spread the devotion to My Sacred Heart, I will write your name In My Heart. I promise to give the greatest graces when you pray these prayers for renewal of the Church and the world and take all who pray them deeply into My Heart. The prayers I give will bring about the reign of My Sacred Heart and the triumph of Mary's Immaculate Heart. I am Jesus Christ, this is My message of January 22, 1998, Please circulate this message to your world. I am the Good Shepherd, I know Mine and Mine know Me and they follow Me. Grace My Shepherds, I will give you the greatest graces for spreading these words to this earth and to your Church. 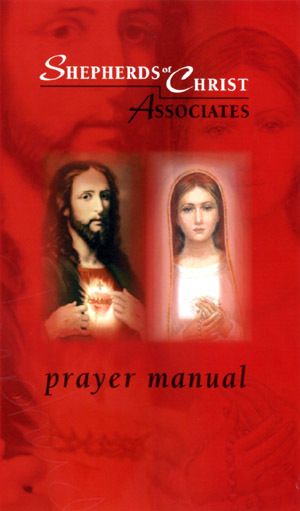 I love you, I am Jesus Christ, the Son of Man, it is the Plan of the Father that Prayer Chapters are begun immediately and the Priestly Newsletter is given to all priests. The Voice of the Good Shepherd speaks through it. 10. Prayer for Priests. "Lord Jesus, Chief Shepherd of the Flock, we pray that in the great love and mercy of Your Sacred Heart You attend to all the needs of Your priest-shepherds throughout the world. We ask that You draw back to Your Heart all those priests who have seriously strayed from Your path, that You rekindle the desire for holiness in the hearts of those priests who have become lukewarm, and that You continue to give Your fervent priests the desire for the highest holiness. United with Your Heart and Mary's Heart, we ask that You take this petition to Your heavenly Father in the unity of the Holy Spirit. Amen"